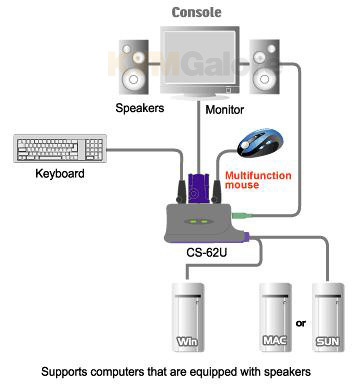 CS62U is a compact KVM switch which allows one keyboard, mouse, and monitor to control two USB computers. Audio connections provide speaker and microphone sharing between the two computers, and the integrated cables keep the installation clean and simple. Switching computers is simply a matter of a few keystrokes, no need to remove your hand from the keyboard. 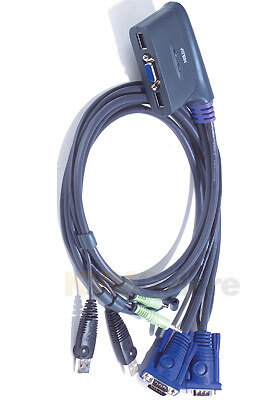 Because the KVM intercepts switching commands directly from the keyboard, there is no software to install on your computers and it is compatible with virtually any operating system that is USB compliant. A unique feature of the KVM is the USB controller built into the mouse port, which allows a powered USB hub to be connected for printer, scanner, hard drive, etc. sharing between the attached computers. Because the connection is a USB controller the CS62U supports the programmable buttons on high end mice. CS62U is DDC2B compliant to ensure correct display resolutions (up to 2048x1536) are maintained when booting or switching computers. CS62U is ready to go right out of the box, it's just a matter of connecting your mouse, monitor, and keyboard to the console side, then connecting the built in cables to your computers.